The image of Antarctica in common circulation is environmental and utopian. The scientist of valour, the investigator thirsting for discovery in a litmus test environment that will give warning about current and impending variations in temperature that will affect the globe. Noble stuff indeed. Despite being deemed a “triumph of the global commons” where “state sovereignty has remained unrecognised” in favour of “the principles of peace and environmental protection”, another, somewhat neglected view, also exists of this glacial wonderland. 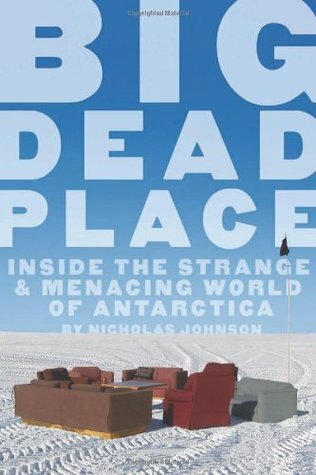 Nick Johnson was one who recorded and chronicled life working in Antarctica at McMurdo Station, doing so with a degree of wit and ruthlessness that led to his masterly compilation Bid Dead Place. But it was not an account of the dingy corridors of White Hall or the dank context of a police state apparatus. He was considering the human encrustations that had found themselves on the earth’s seventh continent, one filled with its fair share of intrepid explorer corpses. Such is the managers’ role of defiance: to resist, and deny the environment they exist in. Manual labour is shunned while “Blue Collar day outdoors provides more exercise than a month of inane managerial exertions.” And it is the role characterised by certain markers: the promotion of mediocrity; the cultivation of “marooned scavengers” who clamber up the hierarchy. Interviews were also posted, featuring the mocking bleakness rife at McMurdo. One contractor is philosophical: “Antarctica prepared me for the War Zones, a stepping stone which made the transition to Iraq a little easier.” Another speaks about not being able to get enough disco clothes. “They are a source of infinite delight.” Then come the somewhat sinister undertone: secrecy, clandestine insinuations and a sense of menace fostered by that big daddy corporation, Raytheon. Illusions are punctured; hope given a good dampening before a regulated world and hierarchy policed by Raytheon. He dismisses the nobility of the US mission in Antarctica, which he rightly noted as being less about altruistic engagement than geopolitical fancy. In such an environment, other projects were being pursued. NASA psychologists, for instance, take to Antarctica’s bases to examine what human behaviour might look like in a simulated lunar setting. The manager’s response to such accounts as Johnson’s is typical: ignore, deny and repudiate. Why did he return if he detested his experiences? Why would he actually work in such a horrid environment? This is the usual deflection adopted by those who wish to accept the horrors they perpetuate, the ghastliness they foment. On being refused a permit to work another stint at McMurdo, Johnson suffered inexorable decline. After taking his life at the end of a shot gun at his West Seattle home, barely a murmur registered across the US literary landscape. Johnson seemed drawn to Antarctica, not so much as a doomed explorer finding El Dorado but as part of an intrepid life that took him to South Korea to teach English drive a taxi in Seattle. On the most barren of terrains, the most viciously hostile of environments, relief as a sharp observer could be found. It was then taken away from him. In refusing him return, the indifferent bureaucrat’s revenge was assured.